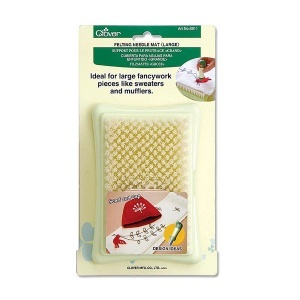 Large needle felting mat by Clover, size 3.25 inch x 5 inch, providing the ideal hardness and density of surface for felting. 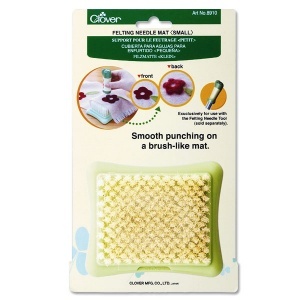 Small needle felting mat by Clover, size 2.75 inch x 3.5 inch, providing the ideal hardness and density of surface for felting. 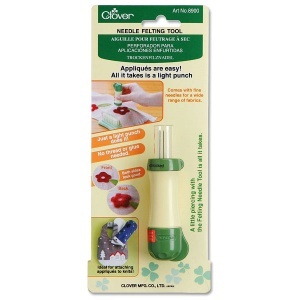 Speed up your needle felting with this tool, it takes 5 needles at once, with a spring action and locking device. Comes complete with 5x 40 gauge fine felting needles. Needle felting is a popular fibre arts craft that creates felt without the use of water. 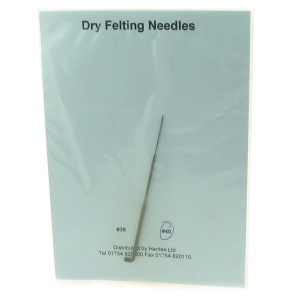 Special 'dry felting' needles that are used in industrial felting machines are used by the artist as a sculpting tool, by piercing the fibre (usually wool) many times, grabbing the top layer and tangling it with the inner layers of fibres. Since the barbs on the needles face down towards the tip of the needle, so they don't pull the fibres out as the needle exits the wool. Once tangled and compressed using the needle, the felt can be strong and used for creating jewelry or sculpture. Using a single needle or a small group of needles (2-5) in a hand-held tool, fine details can be achieved using this technique, and it is popular for 2D and 3D felted work. We have a selection of tools perfect for dry felting work, including dry felting needles and felting pads and foam blocks - please click on a product for more details.